FRISCO, Texas -- Tom Fazio likes to move dirt. The Westin Stonebriar Resort was Tom Fazio's entrance into north Texas golf. He must also enjoy seeing three-putts. 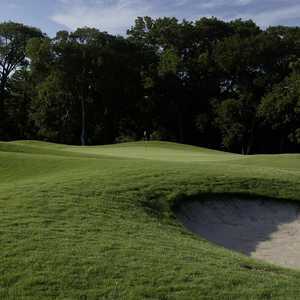 At Fazio's Westin Stonebriar Resort golf course, the celebrated golf-course designer finally made an entrance into north Texas golf, and besides moving 600,000 yards of earth, he laid out undulating putting surfaces that roll almost as quickly as a Titleist off the hood of a Dodge truck. "I've been in the area nine years," Stonebriar's Head Professional Craig Pullen said. "And it's still funny looking when look out over the golf course. When I got here it was two big hayfields with basically no topography at all. It was flat as your kitchen table." But it's the quick A-4 "heat resistant" bentgrass that catches the attention of golfers. "The greens are just unreal," Pullen said. "I haven't play a round yet without three-putting at least three times. I've always thought I was a good putter, but you just can't put your approach to the wrong side or be above the hole on these greens. Most of the people who have played it so far just say 'wow' but then say they love the greens. These are the same greens they put in at Colonial last year." When Fazio finished Las Vegas' celebrated Shadow Creek in 1990 he had moved 28-million cubic yards on a tract that had six feet of elevation change. The result was 213 feet of vertical elevation. Then he added 21,000 trees. The land changes at the Westin Stonebriar weren't quite as dramatic, but Fazio did add a 5-acre lake that you will skirt on nos. 11 and 14. 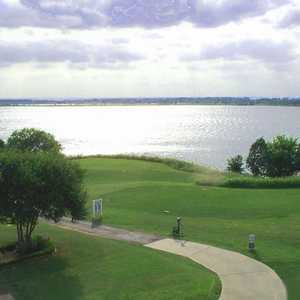 "This lake land was lowered 12 feet to get it to the same level as the lake at Stonebriar Country Club," said Pullen. "Then they went down another 22 feet for the lake." Pullen notes Stonebriar Fazio is a player-friendly course with not many forced carries. One of those forced carries is the approach on no. 2, a par-4, 407-yard, dogleg right. After a tee shot over a wetland to an elevated landing area, the second shot must clear a stream. The green is guarded by a huge bunker on the left. The five-acre lake comes in to play on no. 11, a 412-yard, par-4 dogleg right, and the 421-yard, par-4 no. 14. The 11th goes against the prevailing wind and requires a tee shot between framed bunkering. The green is long and narrow. On the 14th the lake guards the entire right side and once you reach the green you will find a tricky two-tiered surface 46 yards deep. Another feature of Fazio's dirt-moving is that many fairways are mounded on the sides allowing some wayward shots to bounce back toward the fairway. However, Fazio's major intent was to give the golfer a feeling of seclusion -- that he's the only golfer on the course. And much of the time, because of the mounds, he can't see the parallel fairway or its cart path. "I think the golf course still looks natural," Pullen said. "Even with all the dirt moving it still looks like it has always been here. 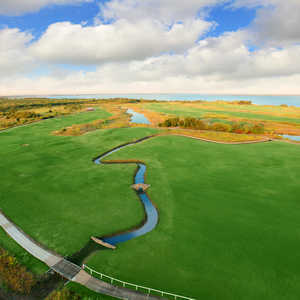 I think lots of people have never thought of going to Frisco for a weekend getaway, but once they play the course they will want to." The Westin Stonebriar Resort is 30 minutes from downtown Dallas and was designed as a business and resort getaway. It has a 24,000-square foot conference center with high-tech audio-visual capabilities. The Fazio course is a welcome amenity for the business meeting or for travel golfers. "The fact that only hotel guests and Stonebriar Country Club members are able to play the course is what sets us apart from area public courses," said Rick Ueno, Westin Stonebriar Resort General Manager. "Minimal play on a course oftentimes means there is less slow play, and the course will stay in better condition." Located in Legacy Park, The Westin Stonebriar Resort is sculpted on 322 acres, in a area experiencing a population explosion, on the northern end of the Dallas North Tollway. Every guest room and suite includes a two-line direct-dial telephone with fax and data ports as well as remote-control color cable television with in-room movies. Large bathrooms feature hair dryers and exclusive toiletries and each room includes an iron and ironing board for convenience and hypoallergenic pillows for added comfort. One- and two-bedroom suites feature spacious balconies with views of the Tom Fazio 18-hole championship golf course, and Westin's Guest Office rooms offer amenities especially for business travelers, including a spacious work desk with speakerphone and task lighting, comfortable ergonomic chair and basic office supplies. The resort features 301 luxurious rooms and suites overlooking the golf course and 200-foot lagoon-style pool. Amenities include a golf pro shop, Legacy Grill, Ernie's Bar, 24-room service, the poolside AquaBar Grill, 24,000 square feet of meeting space, health club and Face & Body Resort Spa. Stonebriar Country Club at one time hosted the LPGA Tour's annual JC Penney Skins Game, which featured four of the top names in women's golf. Annika Sorenstam won it in 1998. The course measures 7,064 yards and is a Joe Finger/Ken Dye design. It is long and demanding and features several tough carries over water. The greens are large, mounded and extremely fast.